Product prices and availability are accurate as of 2019-04-14 05:37:05 GMT and are subject to change. Any price and availability information displayed on http://www.amazon.com/ at the time of purchase will apply to the purchase of this product. GREAT MATERIAL - This round pendant necklace is made of stainless steel, very durable, allergy free and anti-fading, with 20 inches stainless steel chain and a pearl dangle alongside the chain, provide you an elegant look. It is hypoallergenic, and it will not rust, change color or tarnish. INSPIRATIONAL WORDS - 'You're braver than you belive, stronger than you seem, and smarter than you think.' 'She believed she could so she did.' These words reminds that you have the strength and the will to do what it takes. There is nothing that you can't accomplish if you put your mind and heart to it. Always believe that you can, and you will. PERFECT GIFT - This is the perfect inspirational gift for yourself or a friend who needs a little encouragement or reassurance. 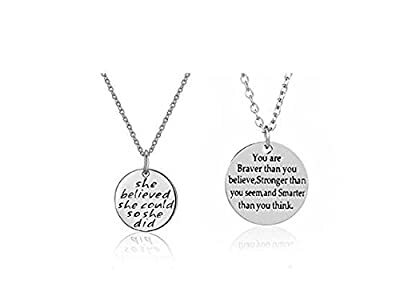 The inspirational necklace will be a special gift for women or girls, you can wear it in any occasions, such as valentine's day, birthday, anniversary, graduation, or a particular party, it will catch people's eyes. WAY TO PROTECT - To clean, wipe with soft cloth. Avoid frequent contact with strong chemicals, such as detergent, bleach, perfume, etc. Store in a jewelry box or soft cloth. Please take it off when you swim, take a shower, or other action involved in water. RISK FREE GUARANTEED - Customer satisfaction is our first priority. We guarantee you will love our inspirational necklace, that's why our product is backed with a 100% money back guarantee. If you are unsatisfied in any way with this product, we will refund your money, no questions asked.